Guests, please note that Georgia Mountain Cabin Rentals has merged with Black Bear Cabin Rentals. Vacation rentals are now being managed by Georgia Mountain Cabin Rentals, explore our inventory and call for additional information and availability on a variety of Blue Ridge cabin rentals! 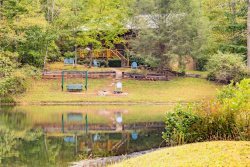 Black Bear Cabin Rentals offers a myriad of privately owned cabins in North Georgia, all of which are available to rent for family vacations, weekend getaways, and honeymoons. All of the log cabin rentals in North Georgia from Black Bear Cabin Rentals come with spectacular mountain views, nestled near babbling mountain streams or overlooking the rushing waters of the Toccoa River. With so many unforgettable sights and sounds in the area, you will never want to leave! For your convenience, we have stocked our cabins with a host of features and amenities. Just some of what you will get with each rental includes a fireplace, hot tub, game tables, high-speed internet, and much more. We even have pet-friendly cabins available. Plan Your Time Away Close to "Home" in the North Georgia Mountains. "The Perfect Gift ... is Time Away"
If your ideal cabin comes with mountain views our Fully Equipped Quality Log Cabins with Fabulous Views of the Blue Ridge Mountains are for you. Black Bear Cabins have a variety of fully equipped, privately owned, quality North Georgia Cabin Rentals with several locations to choose from: log cabin rentals with spectacular mountain views of North Georgia, Tennessee and North Carolina, partial mountain views, and some "nestled in the woods": all located where the Blue Ridge Mountains of North Georgia begin. If your ideal cabin comes with water views our Fully Equipped Quality Log Cabins on or near the Cool Mountain Lakes, Rivers and Streams are for you. Black Bear Cabins have a variety of fully equipped, privately owned, quality North Georgia Cabin Rentals with several locations to choose from: log cabin rentals nestled near babbling mountain streams, overlooking the rushing waters of the Toccoa River, ponds, and lakes all located where the Blue Ridge Mountains of North Georgia begin. All you need to bring to your North Georgia cabin rental is your clothing, personal items, and food. Let the Black Bear Cabin Rentals staff help you plan your North Georgia Mountain vacation or a weekend away. Call 706-632-5751 to make your reservation. We have Cabins that allow you to bring your furry friends ... Visit Our Friends ... "Love Dogs & Cats Too!" Remember "The perfect gift ... is time away" in the Blue Ridge and Appalachian Mountains of North Georgia. Please Review Our FAQ before making a reservation.